by Tozer, A. W.; Smith, Gerald B. 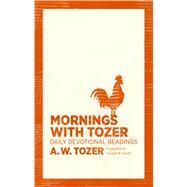 Grab your coffee, find your favorite chair, and begin your day with guidance from A. W. Tozer. Many of these 365 devotional readings come from sermons Tozer preached close to his death in 1963, marking them with a deep concern for spiritual intimacy and true worship. He urges you to pursue God, confess sin, pray fervently, and seek the Spirit. Let this book be a garnish in your feast of God’s Word. As you welcome the morning light and all the sights and sounds of the new day, let Mornings with Tozer awaken your heart. A.W. TOZER began his lifelong pursuit of God at the age of seventeen after hearing a street preacher in Akron, Ohio. A self-taught theologian, Tozer was a pastor, writer and editor whose powerful use of words continues to grip the intellect and stir the soul of today's reader. Among his best-loved books are the classics The Pursuit of God and The Attributes of God.